Anyone with an interest in fashion cannot have failed to notice the trend for embroidered folk-style blouses and dresses, both on the catwalk and in high street stores. This bohemian trend, while a la mode right now, is actually emblazoned with cultural, political and historical meaning. The heavily embroidered coats (Zhupan) and blouses (Vyshyvanka), have actually derived influence from traditional Ukrainian folk dress; Ukrainian embroidery rituals date as far back as the 13th century. The Ukrainian middle classes previously used to use heavily embroidered garments to assert their nobility, and it was used as a status symbol of wealth, and it is common for stage performers and politicians to adorn themselves in embroidered attire. The specific style and colouration of the embroidery, was indicative of the village or town in which it was made, or to which family it belonged- much the same as Tartan in Scotland. The styles of embroidery representing geographical location can be, broadly, split into three general styles. The geometric style still remains predominant in the Ukrainian Polissian area, whereas, in Central and Eastern Ukraine, it is figurative flower and plant embroideries, and in Western Ukraine a geometric flower style embroidery is common. This is not the first time Ukrainian, and other Slavic nations have had their national dress influence western designers, Yves Saint Laurent, in his 1976 Peasant Collection, borrowed embroidery techniques similar to Russian and Ukrainian embroidery, replicating the clothes traditionally worn by Soviet peasants during the era. 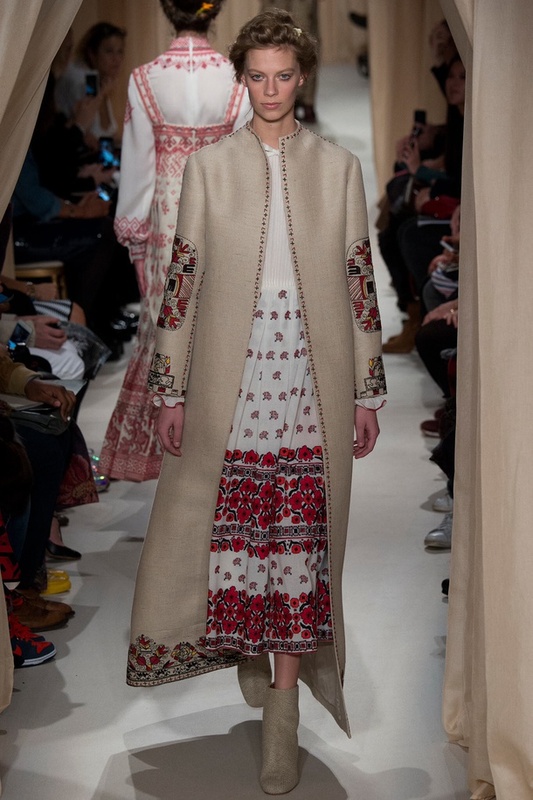 Designers, such as Valentino and YSL, who are influenced by Ukrainian costume, and indeed the costume of any county other than their own, need to be aware of the significance of the features they’re replicating. The readily available access to other countries traditional dress, via the internet, means that designers are often influenced without fully understanding the cultural meaning of what they are appropriating. The context in which an embroidered blouse is worn, affects the meaning of the blouse, for example, if the blouse is from Zara it will represent fashion, whereas the blouse bought from a Ukrainian market stall represents national identity. Jennifer Craik, cultural commentator and author of The Face of Fashion (1992), explains that Yves Saint Laurent, and indeed applicable to Valentino and Dolce & Gabanna, facilitated their very wealthy clientele to ‘play act’ being Eastern European peasants, while safe in the knowledge that their purchase represented the height of fashion, and not a symbol of Ukrainian national identity.